I want to tell you all about the machine and my personal opinions, but first I have to share this amazing deal! Please note this deal is only available on September 9th 2014 starting at midnight! The most powerful cordless vacuum with new anti-static carbon fiber brushes. 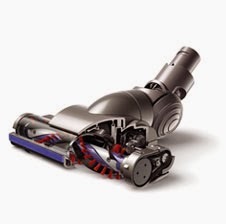 The Dyson Digital Slim is powered by the Dyson digital motor, the vacuum has anti-static carbon fiber brushes to improve fine dust pick-up from hard floors. Other cordless vacuums can lose up to half their suction power in use. Batteries fade, reducing power and their filters clog with dust, blocking the airflow. 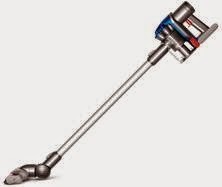 With up to 15 minutes of constant power (13 minutes with floor tool attached), the Dyson Digital Slim picks up more than other cordless stick vacuums. Dyson’s patented Root Cyclone technology – condensed to fit into the machine – spins dust and dirt out of the air using centrifugal force, so there’s no loss of suction. The Dyson Digital Slim vacuum cleaner can be recharged in the docking station or remotely by removing the battery from the machine. Once the machine is fully charged it no longer draws electricity. My son started school on August 25, and on August 21 my hubby finally decided to do the house updates I've been begging him to do for over a year now. Needless to say this mama was not amused by his horrible timing. He did keep his promise and finish it in 2 days with the help of several friends. I was then left with the task of putting everything back where it belonged and cleaning up. Let me point out a few things I notice right away. The Dyson DC35 is light. I was easily able to pick it up with one hand. No cords, since its battery is charged I simply remove the Dyson for its station and clean. No cords means I can easily get into hard to reach places. Great with pet hair and dirt. With 2 little boys, 3 dogs, a hubby and a cat lots of hair and dirt get onto my floor. The Dyson picks it up with easy and I only have to go over an area once. I thought I was going to have a hard time getting up all the dirt since the battery only stays charged for 15 minutes. I was wrong since I only have to do an area once and don't need to fuss with a cord I was easily able to move through my room in record time. I was able to vacuum my entire living room, kitchen, hallway and bathroom and I even did most of my bedroom. Speaking of my bedroom I know I mostly talked about hardwood floors, but my bedroom is still carpet. They Dyson DC35 easily handled the carpet and moved effortlessly for hardwood to carpet. The tools make it easy to clean my couch, curtains and other hard to reach places. I live in a ranch style home so no steps for me, but I can see how its light weight would make cleaning stairs a breeze! I'm very impressed with the ease of use and the fact it went above and beyond my expectations.